The automotive industry has been moving towards completely autonomous driving. Even in Japan alone, all new cars, not only luxury but general and mini-vehicles as well are being equipped with advanced driver assistance systems (ADAS) such as automatic braking. ADAS is gaining broad acceptance and as a result becoming increasingly common. 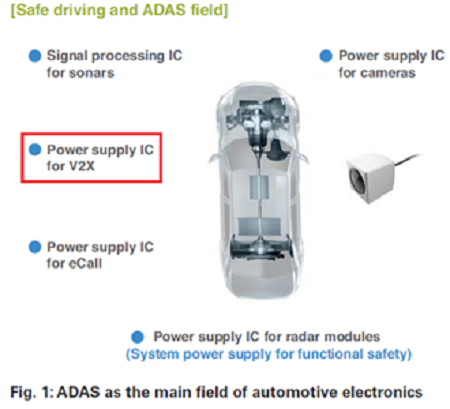 ROHM supplies a variety of products, including power supply LSIs, for ADAS (Fig. 1). 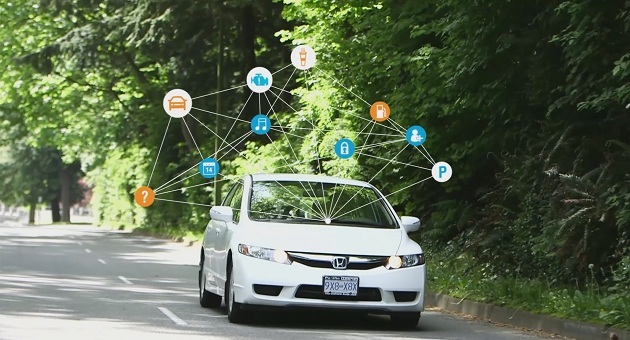 This article will describe one important element: connected cars. In particular, wireless communication in vehicles. The article also looks back on how vehicles were connected to multiple elements through wireless technologies and predict future trends. In addition, it also clarifies the reasons for the various functions and their current status by explaining whether they were introduced in pursuit of greater comfort or to comply with regulation. A variety of wireless functions are incorporated into the cabin space of conventional vehicles. Smart Keys and FM transmitters have been adopted for greater comfort. And recently, wireless LAN and Bluetooth are being utilized in car navigation and car audio systems, allowing occupants to enjoy web content by simply connecting a smartphone. Meanwhile (although not strictly in the cabin area), tire pressure monitoring systems (TPMS), whose function is to notify the driver when tire air pressure drops, has been introduced through regulations in the United States and expanded to Korea and Europe as well. This represents the first system in the automotive industry that combines regulations and wireless communication. Initially, the air pressure of all four tires was directly monitored and information transmitted wirelessly. 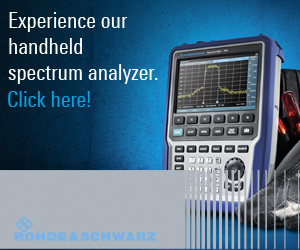 Currently there are indirect monitor types that achieve greater cost reduction as well as systems that check air pressure by analyzing the balance of the car body. However, with these methods there may be times when monitoring is not possible, such as when the pressure of more than one tire is low or the car is moving faster/slower than a certain speed. (In particular, it may not be possible to monitor tire pressure while the car is parked or stopped, which is a major drawback). In any case, the ability to monitor tire pressure in one way or another has become an essential function for new cars in the United States, Korea and Europe. Conventional vehicles have incorporated communication functions based on basic reception protocols such as ETC (Electric Toll Collection), VICS (Vehicle Information and Communications System) [Fig. 2], TV, and GPS (Global Positioning System). These functions provide a greater level of comfort in the vehicle space. 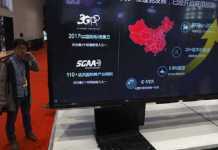 ROHM Group Company LAPIS Semiconductor has been developing LSIs for ETC, VICS, and digital TV broadcast reception, which have been well received in the market. In addition, ROHM provides power supply LSIs, general-purpose LSIs, and discrete and passive components necessary for the peripheral circuits that contribute to the stable operation of those functions. 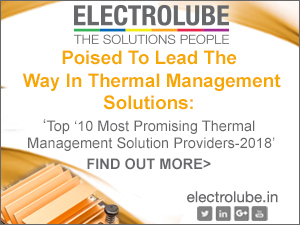 One connected function has been introduced to comply with safety regulations. The ERA-Glonass function was launched in Russia in January of this year (Russian version of eCall). This function is linked to airbags and shortens the arrival time of ambulances in the event of an accident by transmitting emergency and position information to emergency response agencies (corresponding to fire stations in Japan). It is scheduled to be introduced in Europe from April 2018, where it will be mandatory in new cars. Installing this function will prevent the occurrence secondary accidents, especially in cold areas (such as frostbite due to the loss of heating in the wake of an accident). 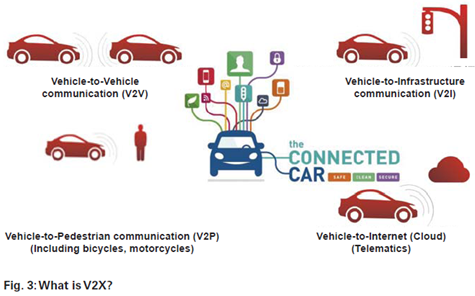 Communication between vehicles and various devices utilizing V2X (Vehicle to Everything) is expected to become the main theme in the future (Fig. 3). It can be thought of as the vehicle version of Internet of Things (IoT), which is garnering significant interest. This collaboration between the automotive and telecommunications industries represents an unprecedented change. About 10 years ago, demonstration experiments of vehicle-to-vehicle and road-to-vehicle communication based on original technology were implemented throughout the world centered on the automotive and the traffic infrastructure industries using a communication method called DSRC (Dedicated Short-Range Communications). Initially, various functions to ensure safety were scheduled to be installed with the goal of preventing traffic accidents. Example of vehicle-to-vehicle communication: At an intersection with poor visibility, drivers can see when another vehicle approaches. Example of vehicle-to-road communication: Traffic signal changes are transmitted to encourage drivers to decelerate. IEEE802.11p, an approved amendment to the IEEE802.11 standard dedicated to DSRC that adds wireless access to vehicular environments throughout the world, was originally scheduled to be regulated in the United States at the end of 2016 and made mandatory in all new vehicles. However, its implementation has faced delays, which can be attributed to the growing movement towards autonomous driving and insufficient measures to combat vulnerabilities against hacking, which is becoming increasingly problematic. 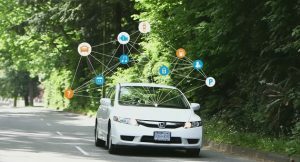 Certainly, there are a variety of sensors used for autonomous driving, including CMOS sensors and millimeter wave, laser, and ultrasound sensors for ADAS, but in order to realize fully autonomous driving it is clear that as many information sources as possible are needed, with vehicle-to-vehicle and road-to-vehicle information being one important piece. Also, unless robust measures against hacking of vehicles are realized, there is a fear that fatal accidents may be caused by completely autonomous driving directly connected to the steering system. For these reasons it is believed that V2X could not gain acceptance. The automotive industry is moving towards completely autonomous driving with core technologies ADAS (Advanced Driver Assist System) and AI (Artificial Intelligence). For ADAS, and especially AI, information using V2X is considered necessary for learning. For example, in a traffic accident the ability to obtain images immediately before the accident along with road-to-vehicle information between the accident vehicle and surrounding environment, vehicle-to-vehicle information between cars, and information from ADAS-related devices will facilitate the spread of information all over the world and call attention to accidents. Furthermore, using this information for AI allows measures to be developed and deployed to all cars, leading to safe autonomous driving. ROHM offers a variety of automotive-grade switching power supplies in different package sizes (2/3/4mm2) and output currents (0.6 to 6.0A) that enable configuration of compact modules for V2X (Fig. 4). The BD9SXXX-C Series features a switching frequency in the 2MHz region that excludes AM bands and supports high temperatures (operating temperature range of -40 to +125°C) essential for automotive electronics, contributing to smaller peripheral components such as coils and capacitors. 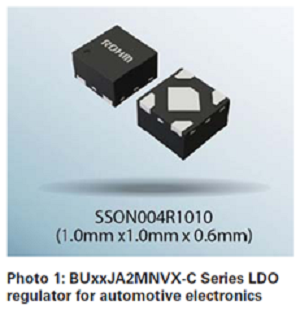 Furthermore, ROHM provides automotive-grade LDO (Low Drop Out) regulators that support multiple power supplies. The ultra-compact 1mm2 BUXXJA2MNUX-C series for modules in particular is designed to meet a variety of power supply requirements (Photo 1). ROHM plans to participate in an organization called 5GAA (Automotive Association) to advance proposals ranging from power supply LSIs to discrete components for wireless-related products that are expected to be increasingly introduced in connected cars going forward. This represents the first cross-industry collaboration by the communication and automotive industries, with the goal of launching and promoting the Cellular-V2X standard throughout the world. 5GAA was established in Sept. 2016 for introducing 5G by the telecom industry and autonomous driving by the automotive industry (Fig. 5). By participating in 5GAA ROHM hopes to realize three Ecos: Eco Earth, Eco Energy and Eco Life, which are part of its CSV (Creating Shared Value). Specifically, we will achieve Eco by supplying compact high-efficiency products that combine manufacturing and circuit technologies for solutions related to 5G communications and autonomous driving in cars that will be manufactured in mass quantities. Advancing communication functions and autonomous driving will lead to a greater number of electronic circuits, requiring further energy savings and miniaturization. Next we will briefly introduce two power supply technologies developed specifically for this purpose. One is Nano Pulse Control, a technology capable of generating ultra-short pulses (50nsec or less) in switching power supplies. 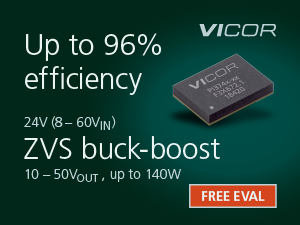 Achieving this breakthrough reduction compared to the conventional 100ns supports higher frequencies and the minimization of coils and capacitors that make up the majority of the power supply section. 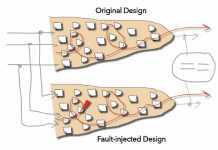 The result is circuit technology capable of reducing component size. The other is Nano Energy, a circuit technology that minimizes circuit current without significantly degrading the characteristics of power supplies. ROHM intends to realize lower power consumption by incorporating this technology in a variety of power supply products and provide high efficiency power supplies with low standby power, leading to products with shorter startup times that do not consume unnecessary power. Although the timing for introducing Cellular-V2X is still unclear, ROHM will continue with product development to supply optimized products as quickly as possible and strive to contribute to the initial launch of this standard.